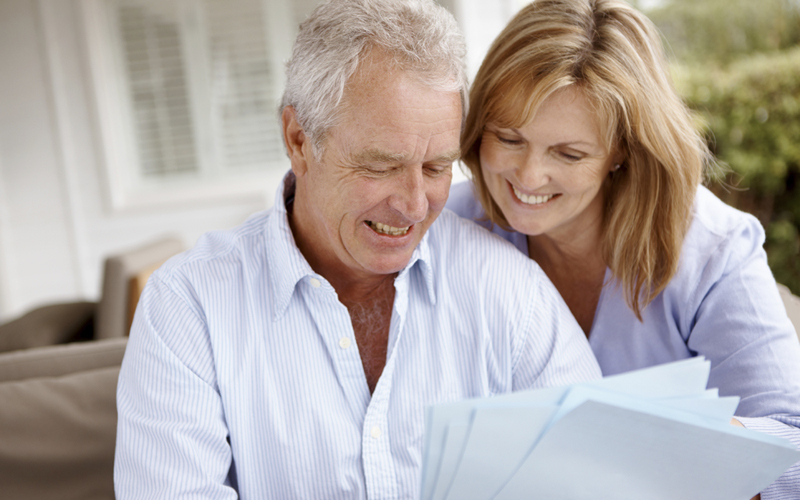 401(k) Plans will benefit greatly from the use of Dynamic Investments. Both companies that offer 401(k) and 401(k) Plan providers will be able to offer simpler, more productive Plans to employees. Introducing the Dynamic Investment 401(k) Solution! The future of 401(k) Plans is bright due to the introduction of a new investment type developed by the National Association of Online Investors (NAOI) called Dynamic Investments (DIs). Presented on this Web page is a brief description of how the entire retirement-plan industry will evolve into the 21st Century through the use of these revolutionary, market-sensitive investments. More detail is found in the recently released book entitled The Amazing Future of Investing book that can be purchased by clicking here. Developed by the National Association of Online Investors over a period of 5+ years, Dynamic Investments are portfolio "products" that automatically change the Exchange Traded Fund (ETF) they hold based on a periodic sampling of market trends. They strive to hold only ETFs that are trending up in price in current economic conditions while selling or avoiding ETFs that track areas of the market that are trending down. As a result, DIs are able to produce returns that are multiple times higher than any Modern Portfolio Theory (MPT) - based, asset-allocation, buy-and-hold portfolio in existence. An example of DI returns is shown below on this page. Dynamic ETF Pool (DEP) - This is where a DI designer places Exchange Traded Funds (ETFs) that are candidates for purchase by the DI - only one is owned at a time. These ETFs represent the asset classes or areas of the market where the DI will look for positive returns. Review Period - This is how often the DI ranks its DEP to identify the one ETF that is trending up in price most strongly. A typical Review Period value is "quarterly". Trend Indicator - This is the Price Chart Trend Indicator that is used to rank the DEP to identify the one ETF trending up in price most strongly at a Review. The top ranked ETF is the one ETF that is purchased (or held if already owned) and owned for one period until the next Review when the DEP is ranked again. ETF Held - This is the ETF owned at any one time. It is an outcome, not a design element. Trailing Stop Loss - This component protects the value of the ETF being held. It automatically sells the ETF should its price drop by a predetermined amount during the period during which it is held. In most cases the DI will go to Cash until the next Review. These are the components that make Dynamic Investments both market sensitive and "intelligent". DIs offer a stark contrast to MPT portfolios that are both static and "dumb". To learn more about how Dynamic Investments work, click here. The NAOI Core Dynamic Investment - This row shows the performance of the simplest possible Dynamic Investment that rotates only between a Stock and a Bond ETF based on which is trending up in price most strongly at quarterly reviews. Average Annual Returns for the Period - The second to last column on the right shows the Average Return per Year for each investment. Sharpe Ratio for the Period - The last column on the right shows the Sharpe Ratio for each investment. This is a measure of how much return is achieved for each unit of risk taken; the higher the better. And any number above 1.0 indicates a superior investment. You can see that the Dynamic Investment performance for this period was exceptional. This was possible because the DI has the built-in intelligence to automatically rotate between the Stock and the Bond ETF based on which was trending up most strongly at a quarterly review. It is designed to hold only winning investments. In contrast, the static, MPT portfolio is designed to hold both winners AND losers at all times. Also note that the DI's higher returns did NOT come with higher risk as its Sharpe Ratio was more than double that of the MPT portfolio. Simplicity - Dynamic Investments have the universal goal of capturing positive returns that the market offers and avoiding losses. This is a universal goal that works for all investors. Thus, there is no need to customize a DI for any investor. DIs can simply be purchased "off-the-shelf" and held for the long term while the DI automatically signals trades as needed. Thus, DIs eliminate the need for extensive education on such things as risk tolerance, asset allocation, economic analysis, etc. The NAOI supplies the simple education needed to effectively use DIs. Higher Returns with Less Risk - Dynamic Investments are sensitive to market movements; traditional MPT portfolios are not. DIs automatically sample market trends on a periodic basis in an effort to hold only ETFs that are trending up in price and to avoid or sell those that are trending down. This enables them to capture positive returns where ever and whenever they exist in the market while avoiding losses. MPT portfolios move up and down at the whims of the market. Absolute Protection from Market Crashes - DIs will automatically sell the ETF owned if its price starts to deteriorate significantly, thus avoiding market crashes like we saw in 2008. Then, when the stock market starts to recover, it automatically buys back in. Eliminating the threat of portfolio crashes will give employees the confidence to participate in their 401(k) Plans without fear. Automated, Objective Portfolio Management - Investors do not need to be concerned with the ongoing management of the DI or DIs that they own. DIs have the internal intelligence required to detect market trends and signal trades to either capture the positive returns in current markets or to avoid losses. This is done automatically, based on objective observations of market trends and without the need for human judgments. In contrast, traditional MPT portfolios provide no guidance on when to change the equities they hold. MPT portfolio management is totally at the mercy of human judgments which inject a massive risk element into the investing process. This is risk that DIs avoid. DIs are Portfolio "Products" - DIs are what the financial world has been seeking for decades - portfolio "products". Each DI is created by an NAOI-trained DI Designer and once created the design does not change, although the ETF held does. As a result, DIs can be sold by a variety of vendors via DI "Catalogs" and bought "off-the-shelf" by investors without the need for customization. The investor simply buys and holds a DI for the long-term as it automatically signals trades to either capture gains or avoid losses. When the world of investing is "productized" everything changes for the better! These factors and others make Dynamic Investments a superior choice over traditional, asset-allocation portfolios in retirement plans of all types. DIs will soon become the standard investment type for all 401(k) Plans. The sooner a 401(k) provider learns about Dynamic Investments, the greater will be their competitive advantage in the future of investing. Single DI - Holding just the Core DI as discussed above as an entire portfolio is a smart choice. But many NAOI students tell us that they are not comfortable allocating 100% of their savings to just one ETF at a time. So other configurations need to be considered including the two that follow. DIT/MPT Hybrid Portfolio - A DI can be used as a building block in a traditional MPT portfolio. For example an investor may allocate 50% of his/her portfolio to the NAOI Core Dynamic Investment and 50% to a more traditional and familiar MPT portfolio format. In such a configuration the DI will serve as both a Returns Booster AND a Risk Reduction element of the total portfolio. Market-Biased Portfolio - This is a special portfolio configuration that consists of one Dynamic Investment and two buy-and-hold ETFs. It is described below as the new and superior "Default" Investment for 401(k) Plans. All configurations that include a Dynamic Investment will produce returns significantly higher than those produced by any MPT portfolio - no matter how sophisticated. And the higher the allocation to the DI component, the better the portfolio's performance will be. Be acceptable to government regulators. The SEC closely scrutinizes 401(k) default investments. They are looking for the criteria listed above. These are the goals used by the NAOI to develop a superior 401(k) Default Investment in the form of the NAOI Market-Biased Portfolio discussed next. Market-Biased Portfolios are the perfect default investment product for a 401(k) Plan or any other type of retirement plan. They are incredibly simple to understand, implement and manage. And they provide higher returns with less risk over the long term than virtually any MPT portfolio or Target-Date ETF/fund in existence today. There are many configurations for a Market-Biased Portfolio. Let's look at the simplest one to illustrate the power of this new investment product. The NAOI "Basic" Market-Biased Portfolio is as simple as it gets. It holds two static investments with equal allocations: e.g. 25% allocation to a Stock ETF and 25% allocation to a Bond ETF. These ETFs are simply bought and held. The third portfolio element is the NAOI Core Dynamic Investment (discussed above) that automatically and periodically rotates between a Stock ETF and a Bond ETF based on price trends. Thus a Market-Biased Portfolio will hold an allocation of 75% Stocks / 25% Bonds when the stock market is trending up, and 75% Bonds / 25% Stocks when the stock market is moving down. And no subjective human judgment is involved in making these trade decisions - all changes are made based on objective observation of market trends. Below is this concept is presented in diagram format. 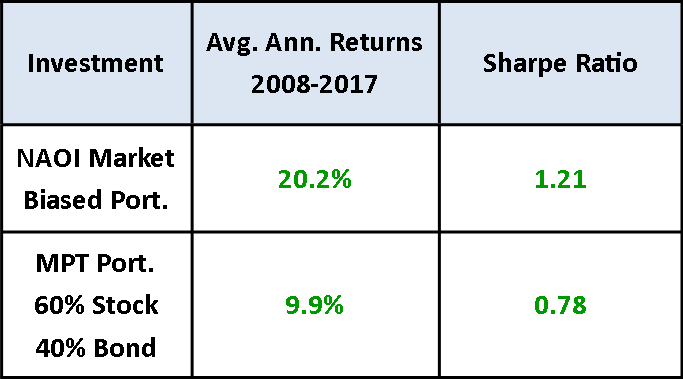 Note that the +20.2% Average Annual Return for the Market-Biased Portfolio DID NOT come with higher risk as the Sharpe Ratio moved up along with the returns! This investment can hold up to 3 ETFs at one time which makes people more comfortable than just holding one ETF as does the Core DI. Who would not have wanted to own this Market-Biased portfolio during the past decade? This is a period that included a massive stock market crash in 2008. During the market downturn, this portfolio automatically changed its investing bias toward Bonds. When the stock market started to recover in 2009 the DI element of the portfolio automatically switched to owning only a Stock ETF and thus the bias of the total portfolio was heavily biased toward Stocks, an allocation that has persisted, with few exceptions, for most of the past 9 years. Should Stocks start to swoon again, this portfolio will automatically switch back to a Bond bias. It's just that simple. You will note also that holding a traditional, buy-and-hold, 60% stock / 40% bond portfolio for the same period earned a very mediocre return with much higher risk. The superiority of an NAOI Market-Biased Portfolio in a 401(k) Plan is obvious. This is the future of 401 (k) Plans. This Web page and this entire Web site discuss how DIs work and the benefits of using them. However, there is only so much information we can convey in this format. A much more detailed discussion of Dynamic Investment Theory and the use of Dynamic Investments is presented in The Amazing Future of Investing book shown at right. Click the image for more information and to purchase this guide to the future of 401(k) Plans and of investing in general. To Purchase: Go to the NAOI Store. Who Will Benefit from the Use of Dynamic Investments in 401(k) Plans? If you currently manage the 401(k) Plan for your company you will want to consider enhancing it with Dynamic Investments. Employee candidates today are looking closely at the benefits package you offer, including your 401(k) Plan. If you offer Dynamic Investments and your competitors don't then you have a major selling point and competitive advantage when attracting talent. The first step in adding DIs to your Plan is to work with the NAOI to define the types of DIs you want to offer and to create an integration strategy with current offerings. With a strategy in place, we can then go to your current Plan provider and ask them to include DIs. If they don't, the NAOI will work with the provider to show them how. If your current provider is unwilling to provide DIs for your Plan the NAOI will help you find a provider that will. Contact us for an initial consultation on upgrading your 401(k) Plan. If you are a 401(k) Plan Provider, after reading this Web page you know that Dynamic Investments offer incredible advantages that traditional investment types such as standalone ETFs and Mutual Funds cannot. You can either wait for the HR Manager of one of your clients to come to you and demand them. Or you can be proactive and contact the NAOI now to create a strategy for integrating Dynamic Investments into your 401(k) Plan offerings. By doing so you immediately gain a major competitive advantage over other 401(k) Plan providers in this very lucrative but crowded market. If another Provider offers DIs in their plan and you don't, you will probably lose in a competitive situation. Now is the time to get started with an NAOI Consultation. The introduction of Dynamic Investments into the world of investing, and more specifically into the Retirement Plan arena, is a massive story waiting to be told. Your audience will benefit from being among the first to learn about this new investment type and management strategy and the advantages it delivers. Leland Hevner, President of the NAOI and Research Director will be happy to work with you to create an article or conduct and interview related to this topic. Hevner's CV can be access by clicking here. And he can be contacted directly via email at LHevner@naoi.org. The NAOI is available to provide Dynamic Investment training/consulting to both companies that offer 401(k) plans to their employees as well as organizations that provide and manage these plans. Click here for more information related to Consulting Support. Click here for more information related to DI Seminars and Training Classes. And click here for our contact information. Whether you simply have questions, want more information or want to schedule a consultation, we would love to hear from you. To stay current with NAOI developments and product releases be sure to signup for NAOI Email Updates at the bottom of this page. naoi dynamic investments - a superior retirement investment vehicle!